Meet Benson Nqumayo. 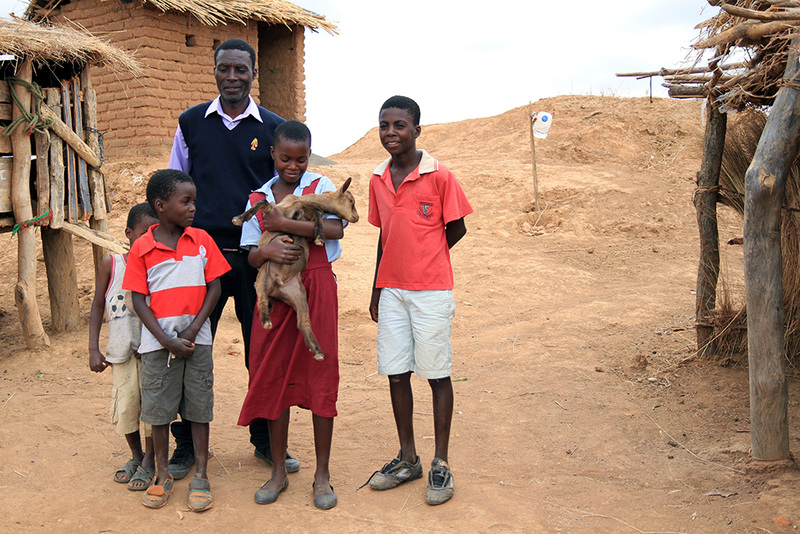 Here he is with his beautiful children and one of their new goat kids, at their home in Kasangani – a village a couple of hours drive from the nearest town in northern Malawi. Over the last 3 years we’ve been supporting their community with a number of different things related to income, water and sanitation and primary education. Benson’s family are an example of how a handful of simple interventions have been coming together to make a really significant difference. Being provided with chickens and goats and training to rear them, has meant that he and his wife have an additional, sustainable income. They also have a source of organic fertiliser for their crops. His family have gained access to clean drinking water, and learnt about simple ways to prevent life threatening illness, like hand washing and stacking dishes in the sun out of reach of animals. Now they are experiencing much less sickness, and children particularly are a lot more protected from things like cholera and diarrhea. Benson’s children now have a primary school where they can go and learn in safety. Because of improvements made to the school, it can now cater for all primary years, so for the first time children from Kasangani are able to go on to study at secondary. With all these things working together, life is easier for Benson’s family. His children have a chance to grow up healthy and educated, and become equipped to solve the challenges that have plagued their communities for so long.